AFG3L2 and paraplegin are cognate ATP-dependent metalloproteases that constitute the m-AAA protease complex in the inner mitochondrial membrane. Co-immunoprecipitation (CoIP) is a useful technique for the analysis of protein-protein interaction. Here, we illustrate a protocol to precipitate the complex formed by human epitope-tagged AFG3L2 and paraplegin heterologously expressed in the yeast Saccharomyces cerevisiae. The procedure employs polyclonal anti-AFG3L2 and anti-paraplegin, and monoclonal anti-HA antibodies to investigate the interaction between the two proteins. The protocol can be adapted to the analysis of other protein complexes. Inoculate yeast cells from a solid culture (agar plate) into 5 ml of YPD medium or appropriate selective medium supplemented with 2% (w/v) D-glucose and incubate at 28°C overnight with shaking. Place cells in 50-ml tubes and centrifuge at 3,000g for 4 min at 4°C. Discard the supernatant and resuspend cell pellets by vortexing in 25 ml of sterile H2O. Combine two cell pellets and centrifuge at 3,000g for 2 min at 4°C. Discard the supernatant and resuspend the cell pellet in 1 ml of 1X PBS. Transfer into 2-ml screw-cap eppendorf tube and centrifuge at 2,000g for 2 min at 4°C. Discard the supernatant and store the pellet at -80°C. Pre-saturate Protein G Resin: place 20 μl of Protein G Resin per sample to be immunoprecipitated in one 1.5-ml eppendorf tube and add 1 ml of 1X PBS/BSA. Mix well. Centrifuge at 800g for 2 min at 4°C. Gently remove supernatant and wash three times with 1 ml of 1X PBS/BSA. Resuspend resin with 1 ml of 1X PBS/BSA and incubate overnight at 4°C under gentle shaking. Pre-saturate eppendorf tubes with BSA: aliquot 1 ml of 1X PBS/BSA into 1.5-ml eppendorf tubes (two tubes for each sample) and incubate overnight at 4°C under gentle shaking. Wash with 1 ml of 1X PBS just before use. Thaw cell pellets (from step A5 of Day 2) on ice and resuspend each pellet in 1 ml of ice-cold Inhibitors Buffer. Centrifuge at 800g for 2 min at 4°C. Discard the supernatant and resuspend the cell pellet in 500 μl of Inhibitors Buffer. Add 1 g of 425-600-μm glass beads. Homogenize using the FastPrep® System (Qbiogene-MP Biomedicals): shake for 15 sec and then keep on ice for 1 min. Repeat 10 times. Check cell breakage under a microscope. Pierce the tube bottom with a needle. Insert the tube into a new 2-ml eppendorf tube and spin at top speed to transfer the cell extract into the lower tube. Centrifuge at 16,000g for 20 min at 4°C. Transfer the supernatant into a new 1.5-ml eppendorf tube and adjust the volume to 1 ml with Inhibitors Buffer. Normalize samples for protein concentration (optimal concentration: 2.5-3 mg/ml). Transfer 1 ml of each sample into the pre-saturated eppendorf tubes washed with 1 ml of 1X PBS (see “Day-2, B-5”). Transfer 50 μl of each normalized cellular extract into a new eppendorf tube and add 10 μl of Loading Buffer. Heat samples at 95°C for 5 min. Store at -20°C (INPUT sample). Add primary antibody to normalized samples and incubate for 2 hr at 4°C under gentle shaking to allow formation of antigen-antibody complexes. (We use 10 μg of monoclonal anti-HA antibodies). Centrifuge pre-saturated Protein G Resin at 800g for 2 min at 4°C. Gently remove supernatant with pipette. Wash resin twice with Inhibitors Buffer (gently remove supernatant with pipette). Following the second wash, resuspend Protein G Resin 1:1 with 1X PBS. Wash a pre-saturated eppendorf tube with 1 ml of 1X PBS for each sample. In each tube, add 1 ml of 1X PBS and 40 μl of Protein G Resin suspension from previous step. Centrifuge at 800g for 2 min at 4°C. Remove supernatant with pipette. Add 1 ml of antigen-antibody complex (from step 13) and incubate for 2 hr at 4°C under gentle shaking. Transfer 50 μl of supernatant in a new eppendorf tube and add 10 μl of Loading Buffer. Heat samples at 95°C for 5 min. Store samples at -20°C (IMMUNODEPLETED sample). Discard the remaining supernatant and wash resin with 1 ml of a freshly prepared Inhibitors Buffer. Shake gently for 2 min and centrifuge at 800g for 2 min at 4°C. Repeat step 22 three times. Remove supernatant with pipette. Add 20 μl of 1:3 diluted Loading Buffer. Heat samples at 95°C for 5 min. Centrifuge at top speed for 5 min at room temperature. Transfer the supernatant into a new 1.5-ml eppendorf tube. Store samples at -20°C [IMMUNOPRECIPITATED (IP) sample]. Analyze samples by SDS-PAGE and immunoblotting (IB) (Figure 1). Day 3: keep samples on ice during the entire procedure. Day 3, Step 21: in the presence of antigen excess (as it occurs when target proteins are overexpressed), immunoprecipitation may not result in the complete immunodepletion of input sample(s). SDS-PAGE of immunoprecipitates may result in the co-migration of antibody heavy (approx. 50 kDa) and light (approx. 25 kDa) chains with target proteins. 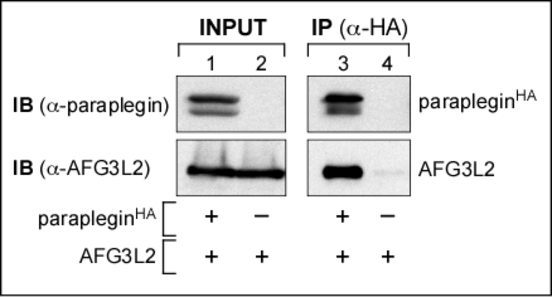 To circumvent the issue of IgG chain detection in the immunoblots, it is recommended that antibodies used for co-immunoprecipitation and immunoblotting originate from two different hosts [in the protocol described here: mouse monoclonal (anti-HA) Ab for immunoprecipitation and rabbit polyclonal (anti-AFG3L2 or anti-paraplegin) Ab for immunoblotting (IB)]. HA-tagged paraplegin (parapleginHA) was immunoprecipitated with mouse monoclonal anti-HA antibodies from yeast cells co-expressing AFG3L2 and parapleginHA (lanes 1 and 3) or AFG3L2 alone (lanes 2 and 4). Lanes 1-2: immunoblot analysis of cell extracts before immunoprecipitation (INPUT). Immunoprecipitates (IP) were analyzed by SDS-PAGE and immunoblotting (IB) using rabbit polyclonal anti-paraplegin (α-paraplegin) or anti-AFG3L2 (α-AFG3L2) antibodies. AFG3L2 was detected in the immunoprecipitate from yeast cells co-expressing parapleginHA (lane 3), indicating AFG3L2-paraplegin interaction. Source: Protocol Exchange (2010) doi:10.1038/nprot.2010.26. Originally published online 7 March 2010.